Rahul, a mechanical engineer, met a Relationship manager at his bank branch last week. The RM kept pitching him with tax saving products. With so many financial products on the table, he was confused and couldn’t make an investment decision. He came back home confused between, what is tax planning and tax saving. He being a non-finance person could not understand the meaning of Section 80C. For many like Rahul, we will explain today everything of Section 80C — the most loved section by the taxpayers under the Income Tax Act. Tax Planning is something that most of us resist and abhor doing it from the start of every financial year. And we tend to repeat the mistake of waiting till the eleventh hour every time. As the financial year draws to a close, we all start feeling the heat and realise that yes, now we have to invest in order to save tax. But have you ever wondered whether it is the prudent way for tax planning? Remember, waiting until the last minute to undertake your tax planning exercise will often drive it towards a mere “tax saving” rather than “tax planning”; which in our opinion is a sub-optimal way to undertake a tax planning exercise. 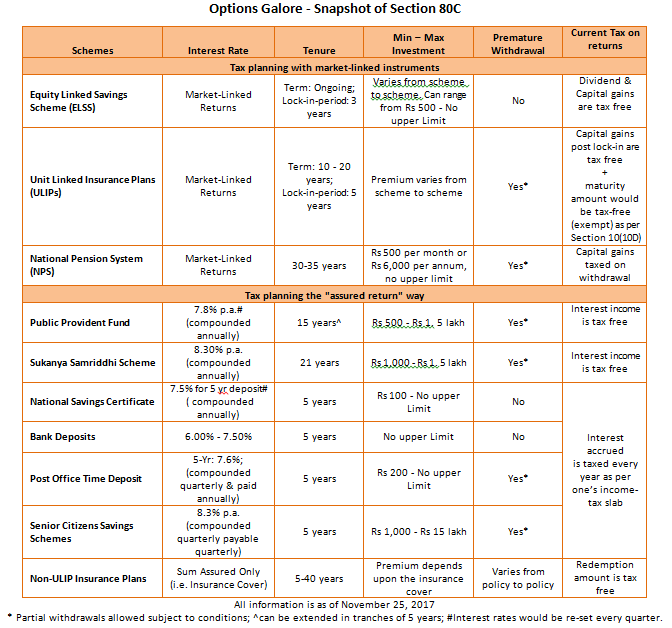 Unlike “tax saving” which is generally done through investments in tax saving instruments / products, under “tax planning” we take into consideration one’s larger financial plan after accounting for one’s age, financial goals, risk appetite, and investment horizon (including nearness to financial goals). By adapting to such a method of “tax planning”, you not only ensure long-term wealth creation but also protection of capital. Hence, please remember to commence your “tax planning” exercise well in advance by complementing it with your overall investment planning exercise. A tax deduction is simply an item that helps you reduce your taxable income by the amount of the deduction. So, by utilizing that particular deduction, you can reduce the amount of income tax by reducing the amount of your taxable income. How can you save tax using different tax deductions? There are different tax deductions available to an individual under different Sections of the IT Act. Section 80C for example has a deduction limit of Rs. 1.5 lakh per annum. When we think about making tax saving investments, the first thing that comes to mind is Section 80C. There are some things you need to keep in mind about Section 80C . And once we’ve gone through these things, we’ll see what else you can do, that does not involve making fresh investments, to save tax. What is Section 80C of Income Tax Act? Hence, if you invest in any or all of the aforementioned instruments; you would qualify for deduction under this section subject to the maximum of Rs 1.50 lakh p.a. But we think, instead of just merely investing in these tax saving instruments, you can also use these tax saving instruments for prudent tax planning. Well, it’s simple! In the aforementioned list, you can classify the tax saving instruments into those offering variable returns (i.e. market-linked instruments) and those offering fixed returns (i.e. assured return instruments). By doing so, you would be able to ascertain which investment instrument suits you best and would extend your tax planning exercise to investment planning too. Investment in ELSS is considered to be one of the best options to save tax because of many reasons like low expenses, short lock-in period, high liquidity, and high growth in long-term. Year 2008 and 2009 had been extremely volatile. Still, many mutual funds have delivered positive return in past three years. Pension fund (or retirement funds) offered by mutual funds can not only be used for tax planning, but is also an effective instrument to plan for a peaceful retired life. Most pension funds are hybrid in nature. Some schemes may not help in maximising wealth as a dominant portion of the assets is skewed towards debt. Also, debt-oriented schemes aren’t very tax efficient due to liability of LTCG tax. You may consider schemes offering a “Wealth Creation” plan, which invest over 65% of the portfolio in equity. Unit-Linked Insurance Plan (ULIP) is life insurance solution that provides for the benefits of risk protection and flexibility in investment. Part of the premium you pay goes towards the sum assured (amount you get in a life insurance policy) and the balance will be invested in whichever investments you choose as per what is available under the scheme - equity, debt, or a mixture of both. NPS is a new, market-linked vehicle for those who do not have an EPF facility to target long-term retirement planning . It is open to any Indian citizen between the age of 18 and 55. Minimum investment is fixed at Rs. 1,000 p.a in Tier I account and there is no minimum investment required for the Tier II account. The NPS offers two accounts: tier I and tier II. Currently, only tier I account is available. This is a non-withdrawable account and investments in this keep accumulating till you turn 60. Among the above the commonly loved and accepted instruments are PPF and Bank Deposits and Post Office Time Deposits. The PPF scheme is a statutory scheme of the Central Government of India. In order to invest in PPF, you are required to open a PPF account (which is irrespective of your age) at your nearest post office or public sector (nationalized) bank providing this facility. The account so opened will have an expiry term of 15 years from the end of the year in which the initial investment (subscription) to the account is made. You can invest in the account ranging from a minimum of Rs 500 to a maximum of Rs 1,50,000 in a financial year in order to enjoy the tax saving benefit under Section 80C. This amount to the credit of your account will be entitled to a tax-free interest – which is 8.0% p.a. (compounded annually) revised every quarter based on previous 3-month G-sec yield. The 5-year tax-saving bank deposit gives tax benefit under Section 80C as the amount you invest in the 5 year FD is deducted from your taxable income. However, interest received on the FD is taxable. Minimum Investment under the scheme is Rs. 1,000 and maximum Rs. 15 lakhs. The amount invested into SCSS is eligible for tax deduction under Section 80C, thus reducing your taxable income in the year of investment. This is a popular investment with senior citizens as it offers liquidity as well as periodic income, i.e. interest is paid out quarterly. Please read the deductions under Section 80C once again in the table below before you start your tax planning. Rightly said Benjamin Franklin, “In this world nothing can said to be certain, except death and taxes”.